Hello dear readers. I must apologize for slacking on the blog-front and this is only my second real blog post from China!! I could say that I have been busy trying to adjust to a new culture where I know only .0001% of the language as well as getting over various physical maladies such as the runs, heat rash, swollen ankles and a stuffed-up head from adjusting to air-conditioning. However, it’s really been a case of me wracking my brains to figure out how I can eloquently explain how I am taking in this complete paradigm shift in my life. Over the last three weeks I have gone through a range of emotions as I adjust to life here in Nanjing. At the time I wrote my last blog post, I was still experiencing the initial emotions and excitement one has when first arriving in a new place. The sense of long-termness had not hit me yet and I was experiencing being here as if I was on a vacation here for one or two weeks. However, after our second weekend here, it finally hit me that we were indeed here for the long haul. It was then that I got the heat rash, swollen feet and had to grab the bottle of Immodium to treat my stomach woes. The Chinese food I raved about in my last blog post started to make my stomach turn and suddenly a McDonald’s double cheeseburger never seemed so delectable (and you know you’ve hit a low point when McDonald’s is all you dream about……). The helpful and accommodating students I referred to before suddenly seemed to give me strange quizzical looks when I would ask for their help in ordering food for dinner at the school cafeteria. And then I realized that I was quite homesick, missing my friends and family, missing Seattle and missing delicious familiar foods. The rug had suddenly been pulled from underneath me and my world had turned upside down. Sunday afternoon shopping at French brand superstore Carrefour. Not related to this blog post but a good example of how crowded it is! I was grateful to have McDonald’s, Starbucks, and Ikea nearby for a sense of familiarity (not only for the food but also for the Western style restrooms). I’m not proud of this nor do I recommend that other Americans try living in major East Coast Chinese cities because they can still have all the comforts of home. I felt guilty that local food was suddenly unappetizing and that I did backflips when I found a western bakery and deli (ovens, baked goods and cheese are hard to come by here) and wanted to spend entire days in our apartment watching pirated DVDs of American TV shows. Thankfully our new friend Jordan- a fellow American teacher, told me that I will overcome this sense and need for isolation. The McDonald’s he pointed out was comfort food. Eventually, the desire for certain familiar comforts will dissipate and rather than them being things I desire all the time, I will realize that I happily will be able to do without many of these comforts and that they will become occasional indulgences. University last Saturday. Loud, constant honking all day! I have also learned to not apply my old logic to how things should work here. For example, I was scared stiff when it came to crossing streets and roads here. You see, even though there are pedestrian crossings and traffic signals for people to cross the street, scooters and motorcycles will ignore the red lights and continue to go through traffic whether it means going straight, turning suddenly down an intersecting street or getting around on a sidewalk- whichever seems to be the quickest approach. As a pedestrian you can cross cautiously, run across as quick as you can in the hope of avoiding any approaching scooters or you can hope that they will swerve around you (do you remember that video game called “Frogger” from the early 80’s? Yea- like that). This angered and frustrated me to no end when we first arrived because it just seemed like a completely lawless, disorderly, self-serving system (or lack thereof). But that was using my old experiences and expectations of how drivers should behave and act in any US city. I now cross the street a little more comfortably if not with more savvy ever since I have thrown away this prior US-logic. restroom with bin for soiled tissue. I also realize that I need to ease in to some activities, functions and rituals. Take the public restrooms. 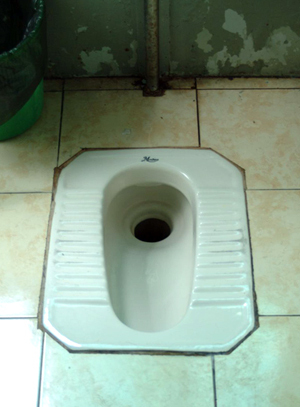 Most standard Chinese bathrooms have squat-toilets which means that the toilets are embedded into the floor with two places for your feet on either side of the bowl. It actually makes a lot of sense to squat while you do your business. In fact I’m sure it’s the most natural way to do it and can be argued to be better for your bladder and other inside parts. Some would say it’s more sanitary as well. Don’t expect to find toilet paper in public restrooms here either. Always be prepared to carry small tissue packets or toilet paper rolls (without the inner cardboard tubes) and never put toilet paper in the toilet! Little waste baskets are provided in the bathrooms for you to put your soiled paper. And isn’t this also better for the septic system? I would say so. Nevertheless, it’s a big adjustment for me to use the public restrooms here (which is why I happily use Western toilets at Starbucks, etc. when they are available). If I can’t get over my fear of using public restrooms and squat toilets, I will get really squeamish when it comes to traveling off the beaten track here in China and using very primitive, rural toilets. Therefore I have resolved to “ease” into using squat toilets here in Nanjing. Today I started using the squat-toilet restrooms here on campus which are pretty clean and sanitary. This may seem like a trivial thing but I am quite proud of this accomplishment and know that I will soon be closer (literally and figuratively) to using toilets in even the most appalling of conditions. Baby steps, baby steps….. In order to not fall victims to the sense of isolation and homesickness one can experience in being in a new place, Derek and I are slowly putting ourselves out “there” by trying to meet new Chinese friends as well as getting to know the other foreign teachers in our building. This is why I volunteered to help out last Friday at a booth for the English Salon, a social club on campus here at Nanjing University of Finance and Economics where students and foreign teachers can get together to practice English (and Chinese!) conversation and experience such American holidays like Halloween and Christmas (the non-religious side of course). I walked over to the north end of the campus with Randy, one of the new American teachers here at NUFE but certainly a seasoned pro here in China (he’s been here for almost ten years, speaks extensive Chinese and has a Chinese wife). When we arrived we helped the older Chinese students recruit new freshmen to join the club. To be honest I wasn’t very helpful in effectively recruiting new students. Most of the shy, timid freshmen shied away as soon as they saw the big, imposing figure that I am coming towards them and then they completely scampered off as soon as I opened my mouth and said “Hello!!! Would you like to join the English club??? ?” One of the older students politely said, “Hmm, you are quite tall.” And then suggested I might sit down and take a rest. But that is how I met my new friend “Tom” whose English name I helped come up with right there on the spot (so in a way, I have helped “give birth” to someone’s new identity here!). After a while, Tom and Jillian (also obviously not her Chinese given name) whisked Randy and me away and brought us to the cafeteria for lunch. They sought out a corner in the cafeteria that was comfortably situated near the air-conditioner and told us to make ourselves comfortable as they went and selected some dishes for us for lunch. A few minutes later they came back with some tasty dishes such as a tomato scrambled egg dish, some shredded pork with shredded cucumber on top and for me alone- some “zhu tong” which is translated literally to “soup in a bamboo bowl” (**to all my Seattle friends out there- Stan in particular- I had to share this soup reference. Even here they have figured out my love of soup!). Tom and Jill so patiently and graciously helped me with writing down in my little notebook the correct tones and pronunciation as well as pin yin, the romanization system for transcribing Chinese words and names, of all the foods we were eating. It was sitting right there and then with Randy, Tom and Jill that I suddenly realized that Chinese food was again delicious and appetizing for the first time in a week and I had no desire to rush to a McDonald’s for a bacon, double cheeseburger. I was so overwhelmed and touched by their generosity and graciousness and was curious to learn more about their lives. After eating our lunch and the cafeteria almost empty, we strolled our way back to the main part of the campus until we parted ways. 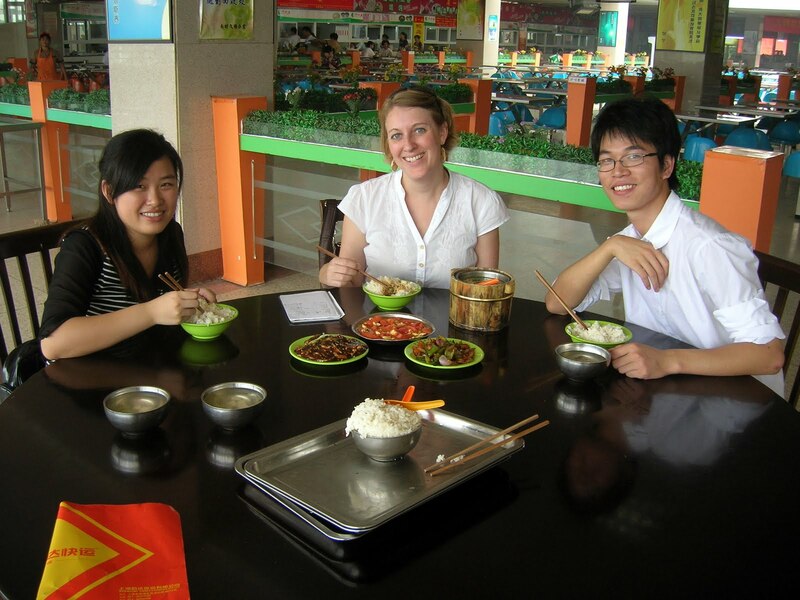 Jillian offered to help Derek and me with any Chinese we are interested in learning and Tom also extended the offer for any help we would need. Enjoying lunch with new friends Jillian and Tom. Derek and I have had a dream for a couple of years to live overseas. One of my personal reasons for wanting to travel and live overseas was to push our comfort level. I am learning from our experience over the last few days though that pushing your comfort level doesn’t have to be an uncomfortable, icky, painful or stressful experience. Maybe a better way of phrasing it should be finding your own comfort level. Everyone who comes to China eventually finds their own comfort level. Some may be completely content traveling to remote, desolate spots and living for weeks in an abandoned home with no contact with other foreigners or other people for that matter; others’ comfort level can be reached traveling in larger cities with the occasional comforts from home; and then there may be others who enjoy just staying in Nanjing and enjoying all it has to offer as a city and its elements of Chinese life. We have not found our own comfort level here yet. It may be one of the three I just mentioned or perhaps it will be a combination of all three. Exploring and finding our own comfort level here in China is why we’re here.